World Aeronautical Charts cover land areas at a standard size and scale for navigation by moderate speed aircraft and aircraft operating at high altitudes. The topographical information includes city tints, principal roads, railroads, distinctive landmarks, drainage patterns and relief. The aeronautical information includes visual and radio aids to navigation, airports, airways, restricted areas, obstructions and other pertinent data. Because of their smaller scale, these charts do not show as much detailed information as appears on the Sectional and Terminal Area Charts. 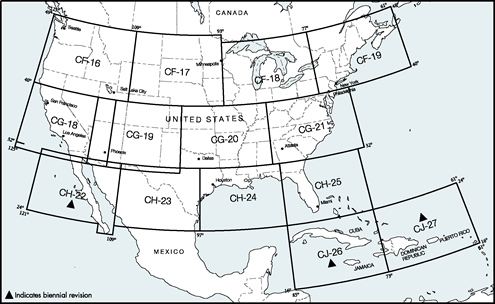 For example, Class D and Class E airspace and the limits of controlled airspace are not shown. Because some information is not shown, World Aeronautical Charts are not recommended for exclusive use by pilots of low speed, low altitude aircraft. These charts are revised and updated annually, except for a few in Alaska, Mexico and the Caribbean, which are revised biennially.